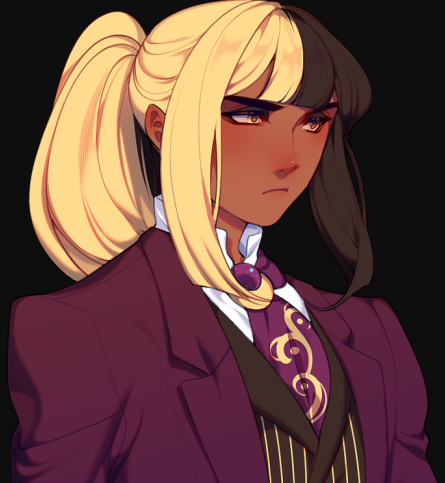 Khilua is very much an antisocial person; it isn't that he hates people, but his upbringing didn't require much social interaction outside of training and communicating with other assassins. He finds himself in more awkward scenarios than he's used to, and tends to get flustered and annoyed as a result. He's a very serious, cautious person, mostly due to the fact that he does not trust everyone he meets. He is a bodyguard, after all, and has learned the many ways one can pretend to be a friend when they are really intending to harm. He comes across as unkind, but the reality is that he has had to be selfish in order to look out for himself. Making difficult choices is not something he likes, but he does it because it is necessary. Khilua is very adverse to the idea of fully assimilating with Ostaran culture, mostly out of distrust and the hope that it will be possible to someday return home. Despite this, he still studied the language extensively so that he can catch any glimpse of threat or beneficiary admissions. He has been a quiet person most of his life, both out of shyness and necessity as an assassin. He never chose this specific lifestyle, but has learned that he must do what he needs to in order to survive. This remains true in the new world, with a noble to protect. Khilua is tall and fit, with lean muscle and broad shoulders. He grew up as an assassin and fighter his whole life, and his body type represents that. Hus eyes are bright gold, and his hair is long, reaching past his back, and is split colored- blonde on the right, black on the left. This particular hair trait is rare but coveted in Sidoni, which had made him an initial target for the Queen. His devotion to an assassin lifestyle cancelled that out. He tends to wear suits, specifically fitted and made for him by Etika. Black is his preferred color to wear, but purple with accents of gold represent his upbringing in Sidoni. If he isn't wearing a full suit, he is wearing button-up shirts and slacks that have a slightly more casual tone, but still count as formal. Occasionally, Etika will beg him to wear something more feminine to model off to the world. ...and ended up falling back-first into a fountain. In Pyongyang, Ostara. Confused, but understanding that he was no longer under threat from assassins, he assessed the world around him. Tall buildings, floating buildings, vehicles that zoomed across the ground, in the air, and- floating mechanisms that appeared to be watching. Not safe here, either. He threw up his hood and backed into an alley, making his way through the dark, barely populated area of the city. He was soon tracked by two twins, male and female, with bright blue hair streaked with white and gold, who told him to follow to where he'd be safe. Untrusting, he followed...knives pointed at their throats. They made their way into one of the zooming vehicles, and into a very crowded part of the city, up into the highest buildings, and soon, into the penthouse of Etika, where he was met, face to face, with the man he'd tried to kill years ago. Etika recognized his clothing as a person of his country, and immediately grew wary of whether or not he had be sent to find and kill him, or return him. Khilua admitted to having been there to kill him on the night of his disappearance, but it makes sense now that they were both here, in the same world. He also expressed egret for having frightened him that day, as he was sold to the Silent Assassins at youth, and soon fled once the countries went to war. Khilua ends up shedding his true name, his mercenary clothes, and becomes a personal guard for Etika. Not compeltely of Etika's choosing, but he grudgingly accepted. With the condition that Khilua would have to put up with whatever whims he had...such as modeling clothes for him. The two have been close ever since, despite Khilua's rigid, stony demeanor and distrust of anyone who comes near. The two are partners, but Khilua has always been embarrassed to admit or accept his own feelings. Khilua is loyal to Etika completely, giving himself to the life of protection as a bodyguard. He assists Etika, despite his own protests that it is dangerous, in helping locate and safely retrieve new arrivals from their world or others. He hopes to never come across an assassin, but knows that the Shift and Rift are completely random, and that it may be inevitable with someone else had his skill or potential. 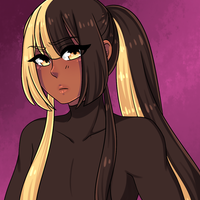 Khilua's split-colored hair is a rare trait in Sidoni, and is highly coveted. Blonde and black are the common hair colors of the kingdom, but split hair has always been something unique to the region. He escaped a fate similar to Etika's when his parents decided that the best way to spare him was to send him to a mercenary camp and bloody his hands. Doing so would make him unfit for the role of the Queen's Bride. Scimitars and daggers were his main choice of weaponry back in Sidoni, but in Ostara he has mastered the katana and various guns. He has been a mercenary, an assassin, and a thief. When he left the Silent Assassins, he had to be on the run constantly and steal and hide. When he first arrived to Ostara and laid eyes on Etika, he thought it was his duty to return them both back to their world to atone for nearly killing him years ago.It took a while to get him to stop referring to Etika as "Your Eminence." Windstrike | Windstrike is a skill that combines low-level wind magic with the strike of a blade. Depending on the magic skill of the user, the sharp gust of wind can be highly destructive. Earthstrike | Another skill that combines a low-level skill of magic to use; combined with a blade, it can cause a seismic event in the surrounding area. Alruna's Kiss | A powerful ability given to him by the pactio between him and Etika; with their combined power, he can nullify magic whenever he strikes outwards towards an enemy, when blocking an attack, or when simply using the blade to touch something charmed or cursed with magic. Using and learning many types of fighting styles and weapons, both from Amestris and Ostara. Guns are the most recent weapon he has learned to master. Despite having low level elemental magic ability, he is a strong combat mage when paired with Etika's pactio magic. Watching the skyline at night. Perusing weapons caches, especially decorative ones. Learning new fighting styles and weapon uses. Watching Etika's performances on shows. Helping people from the Old World. Being Etika's model for feminine clothing. Anyone who attempts to harm or threaten Etika. The government's treatment of magical people. Remembering his past in the Old World. Khilua is from Sidonia, much like Etika. He was part of the Silent Assassins, an organization that had been tasked with assassinating Etika when he was about to become a Royal Bride. Khilua was present when Etika suddenly disappeared, and saw an opportunity to escape during the confusion and chaos that followed. A few years later, Khilua was tracked down by the Assassins and was cornered in the Red Desert. He suddenly found himself in Ostara, where he met Etika and vowed to serve and protect him as penance for his part in the attempted assassination of Etika. They have grown close over the years. Ezra and Enu are twin orphans from the colony planet Ios who came to Ostara for refuge. They grew up learning how to fight at young ages, as well as much about computers and electronics and how to gain access to just about any computer system in the solar system. The twins found Etika and Theo when they were testing out ways to detect magical disturbances in the atmosphere to see what was out there. Due to their desire to try and find out what happened to their childhood friend Roman, the two became a huge part of the Eye of Alruna and protecting the system. Khilua has learned much about guns from them. Although initially very suspicious and skeptical of Theo's role in Etika's organization, Khilua learns about Theo's past and current fate as an enslaved, contracted Incubus in Hellas. He realizes that Theo has protected hundreds of younger demons like himself from being part of the cycle of slavery and has thus extended his time contracted for thousands of years. Khilua has made it a point to offer his services as a bodyguard or to 'take care of' anyone who physically harms Theo.